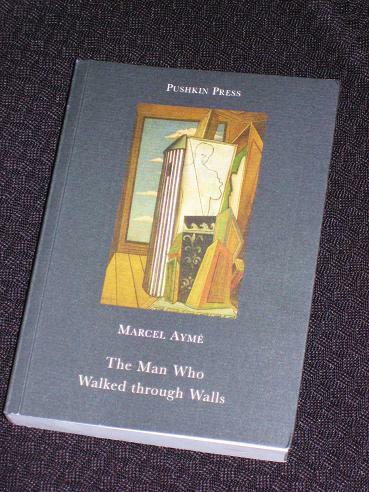 Marcel Aymé’s collection, The Man Who Walked through Walls (translated by Sophie Lewis), was released in 1943 and comprises ten stories, each a little gem in its own right. Some are short, realistic tales, others are whimsical, fairy-tale-like fantasies, while a few are verging on science-fiction, altering one little aspect of the universe, then casually following the consequences of the change. One thing they have in common is that they are all fascinating and exceedingly-elegantly written. This bizarre style is continued in the next few stories. Sabine Women, the longest of the stories included here, follows the troubles of a woman who is able to divide herself into as many different people as she likes. Of course, once her doubles get bored, they too begin to duplicate, causing problems across six continents… In The Problem of Summertime, a bold attempt to end the war by moving time forward seventeen years comes unstuck when a man visits a tiny village which is unaware of, and unaffected by, the international decree. Our hero then returns home with knowledge of what he thinks is the future, but day by day, he becomes less sure of whether it all actually happened. As well as being the driving force behind While Waiting and The Problem of Summertime, the Occupation is also the underlying idea in Tickets on Time. In this story, written in diary form, we learn of a scheme the government has come up with to ease food shortages. People are divided into categories, depending on their usefulness, and are accordingly given ration tickets… for time. Our diarist, writer Jules Flegmon, initially approves of the idea – that is until he hears that artists are not considered to be terribly useful and will only be allowed to live for two weeks each month. At midnight on the 14th, he will disappear, reappearing on the first of the next month… Aymé sets out the general concept of the story and then explores it in depth, leaving Flegmon to find out what really happens to the people who temporarily vanish. More importantly, after trading tickets, he also learns what happens to those who are left behind for the final part of each month. Sounds fascinating. Will keep an eye out for it. Pinning it to help me remember! Like I said on his blog, this is something we read in school when we're 11-12 if the teacher chooses to. (I read it later and I remember I liked it a lot. I hated Les Contes du Chat Perché though. John Self's review put this on my TBR list. Your synopsis of “Tickets on Time” comes right on the heels of my finishing Victor Serge's Memoirs of a Revolutionary which discusses exactly this sort of division of people under the Occupation as regards rationing (particularly of exit visas), as well as the excruciating waiting involved – for indeed those left behind often did vanish, right into the horrors unfolding in Europe at the time. having thoroughly enjoyed Traveller of the Century its great that presses such as Pushkin are publishing such fantastic works of lit.